Hiya! 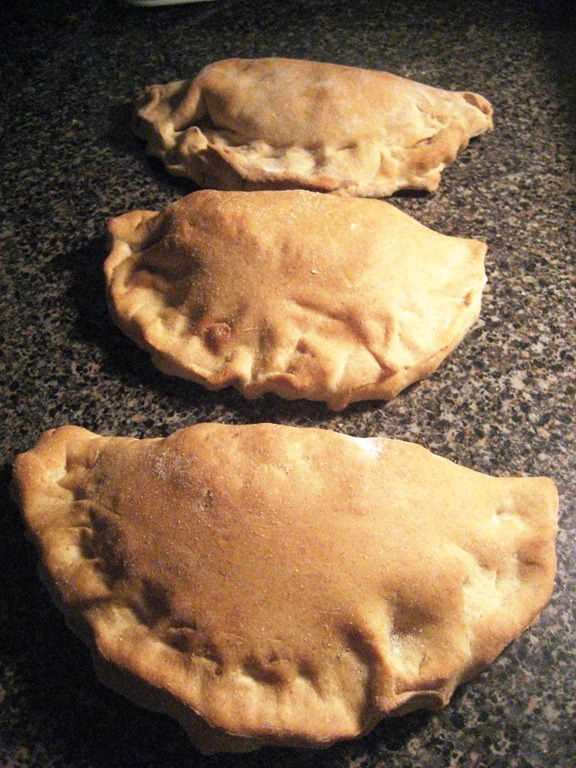 I have a really awesome recipe to share with you today – mini calzones! 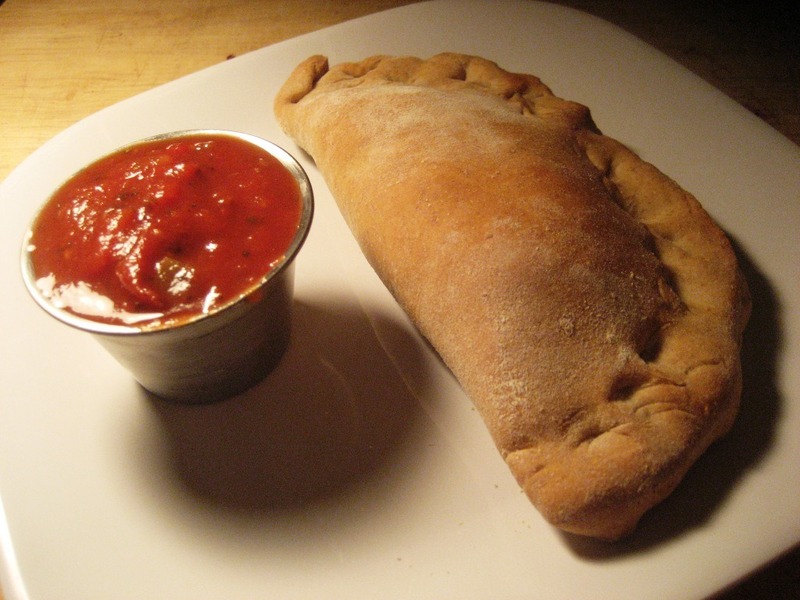 I looooove calzones, but they are usually quite heavy and so loaded with fat and calories that I shy away from them. Making them at home is the perfect solution because you can stuff them with whatever you want, control the amount of cheese and dough, and make them however small or large you want to, and they are still totally delicious and take just an hour from start to finish. 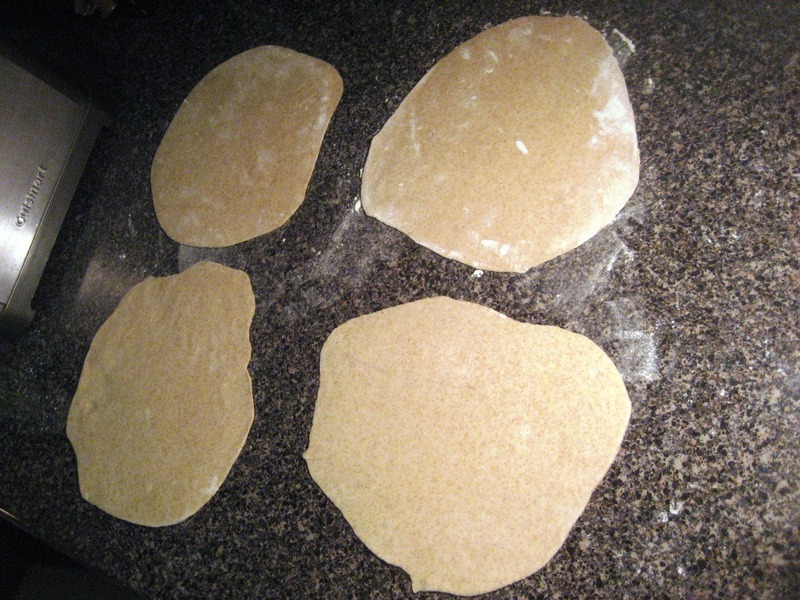 I made the dough for these from scratch, but you could easily use store bought whole wheat pizza dough. Keep in mind that would change the PointsPlus values (and cut down the prep time drastically!). As they are now, these are just 7 pts+ each and so totally worth it. Feel free to experiment with different veggies, chicken and/or whatever else you can dream up to stuff these with, and let me know how they turn out! Also – I’ve decided to start making my recipes printable (thank you Kara!). 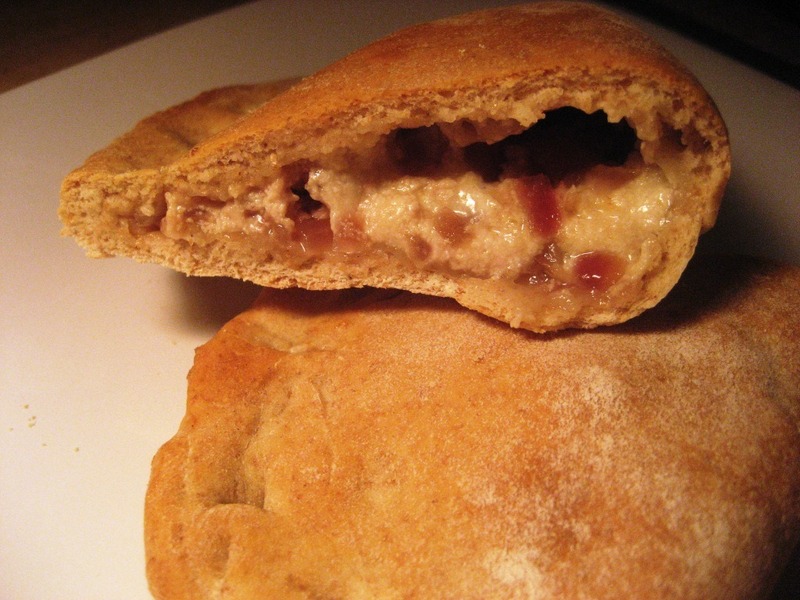 It’s going to take me a while to convert all my recipes so bear with me, but so far I did the Quinoa Burgers, and these Caramelized Red Onion Mini Calzones and will continue to add new recipes to there, and old ones as I find the time. I hope that makes it easier for you if you’re trying any of the recipes you find here! Serves 4. 7 Pts+ each. Printable recipe here. It almost looks creamy, but those are all just tiny little bubbles on top. 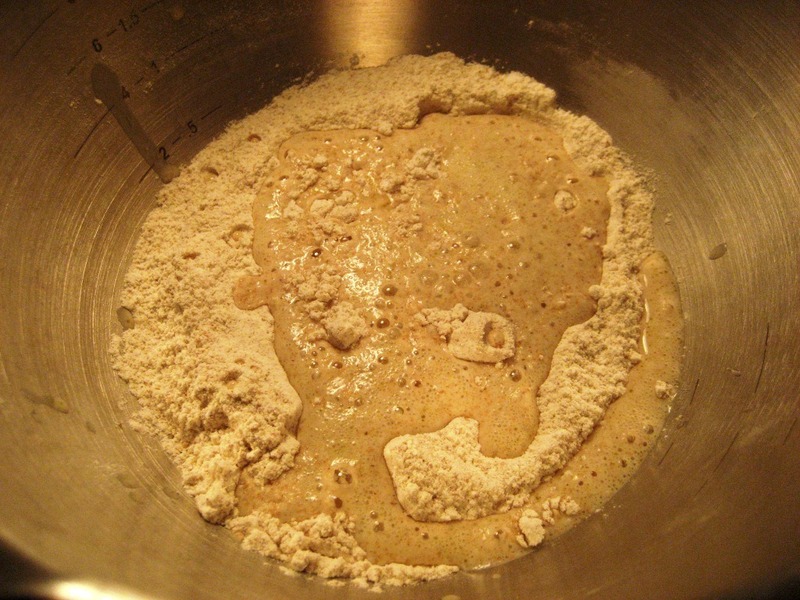 If yeast scares you – don’t let it. I still have a mini panic attack every time I use it, but just let it do its thing and it’ll work. I promise. 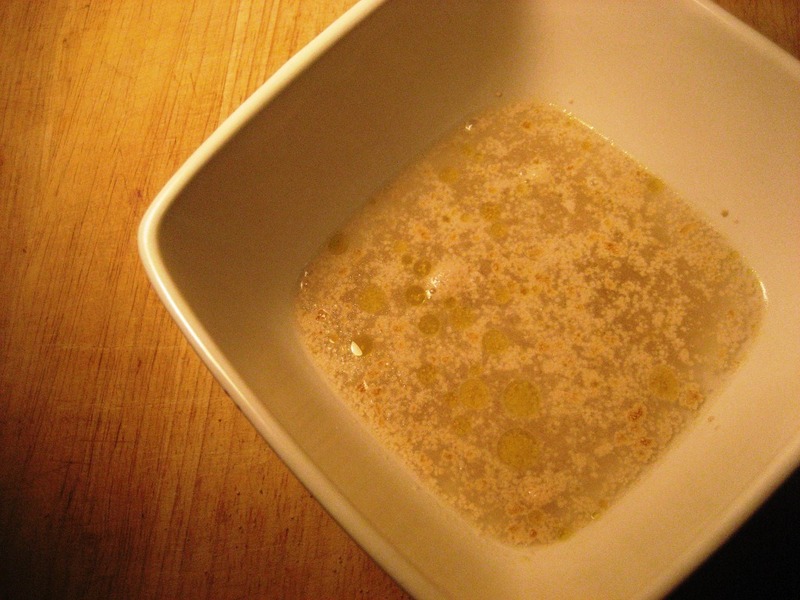 While the yeast is activating, add your dry ingredients to a large bowl – whole wheat flour, white flour, and salt. 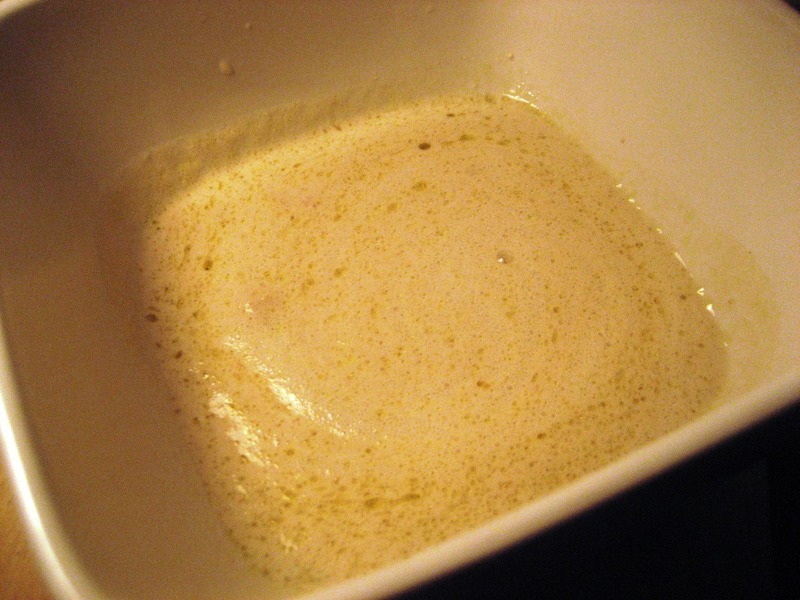 Whisk them together, and then pour in the wet mixture once the yeast is activated. 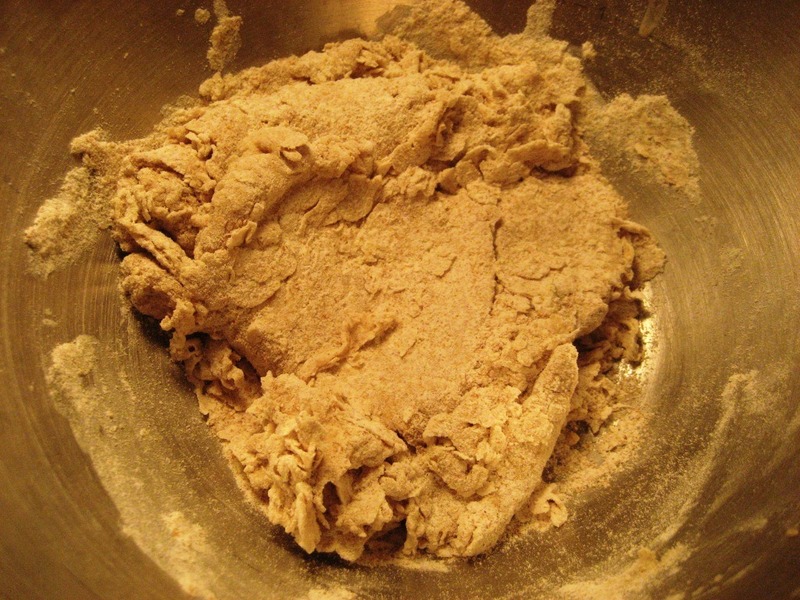 Stir to combine until dough forms. 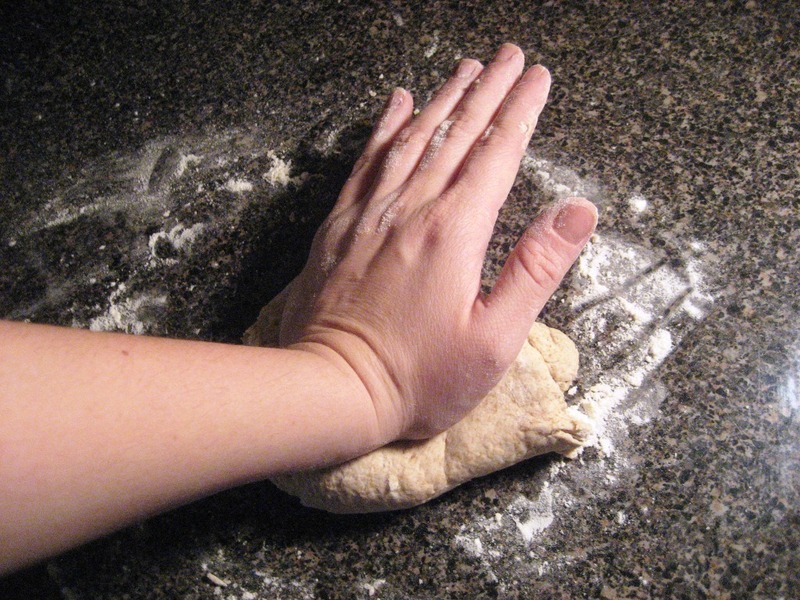 Now he comes the physical labor portion of the program – dump the dough onto a lightly floured surface (ie your kitchen countertop) and knead for 10 minutes. Look at the clock to be sure. I kept thinking 10 minutes had passed every 30 seconds or so because this is hard work! 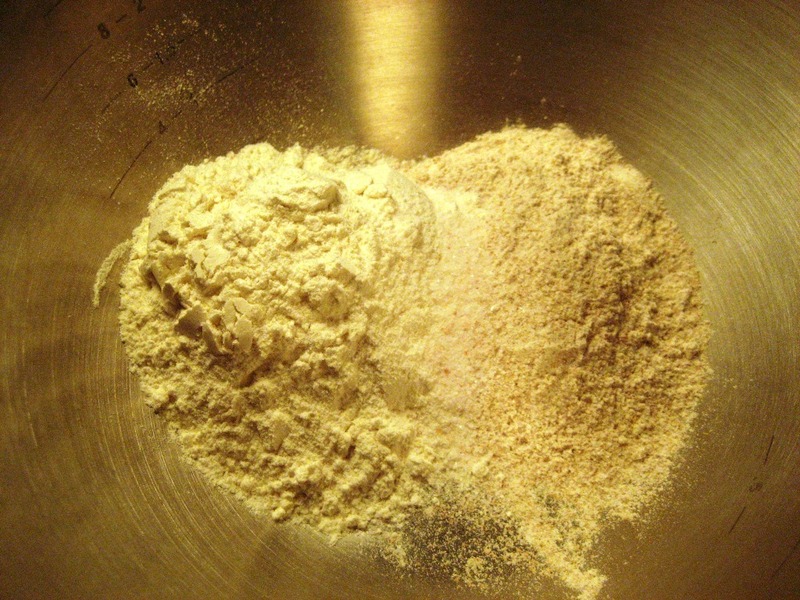 While you are kneading the dough, add more all purpose flour as needed. 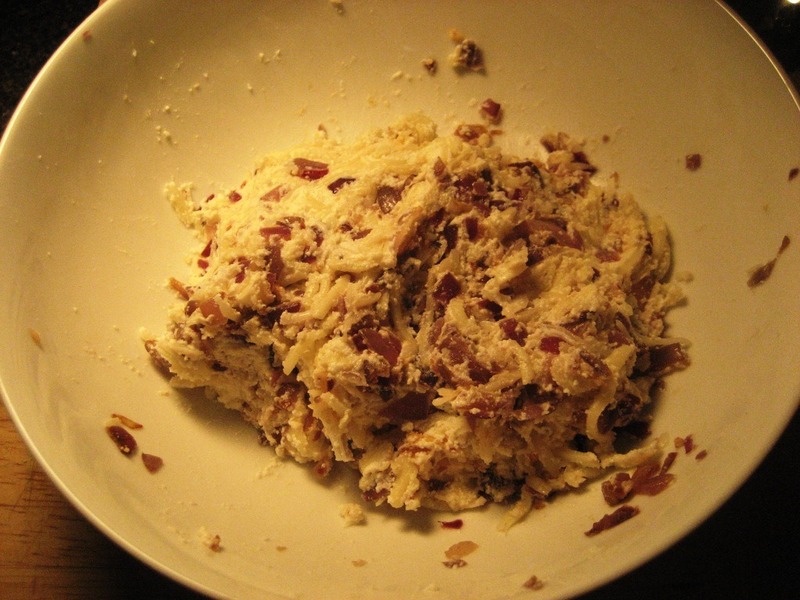 I had to sprinkle an additional 1-2 tablespoons into the dough, but you may not need any. The general rule of thumb here is to add a little bit of flour if it’s a little sticking to your hands. 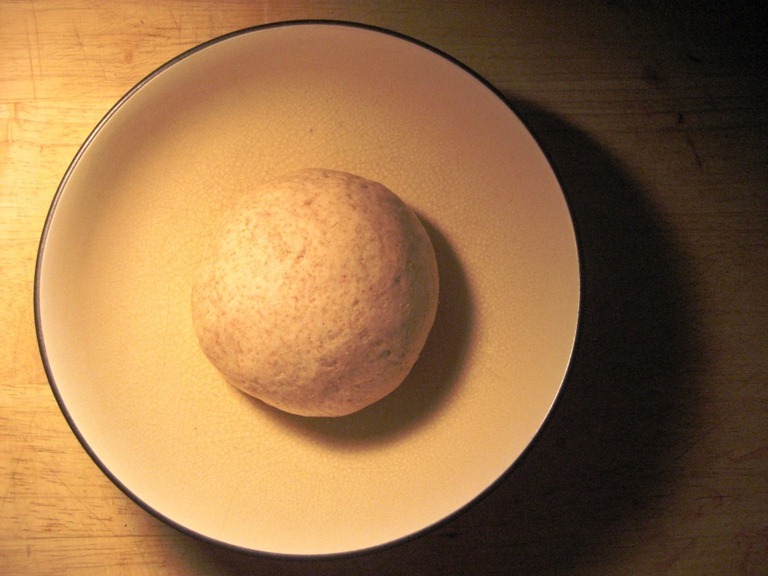 Once those 10 minutes are up, you’ll have a nice little smooth ball of dough. 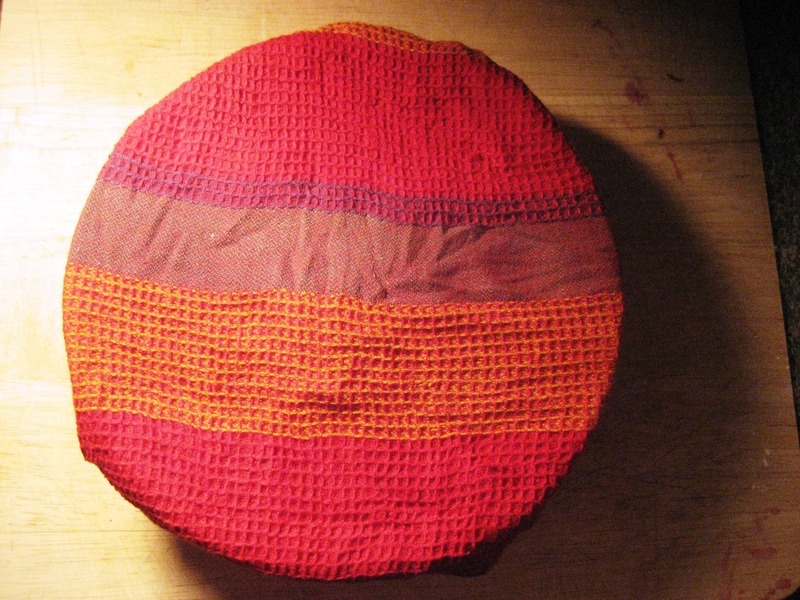 Cover it with a wet towel (or paper towel) and leave it at room temp for about 10 minutes to rise, while you prep the filling. Here’s where you start if you’re using store-bought dough (no shame in it!). 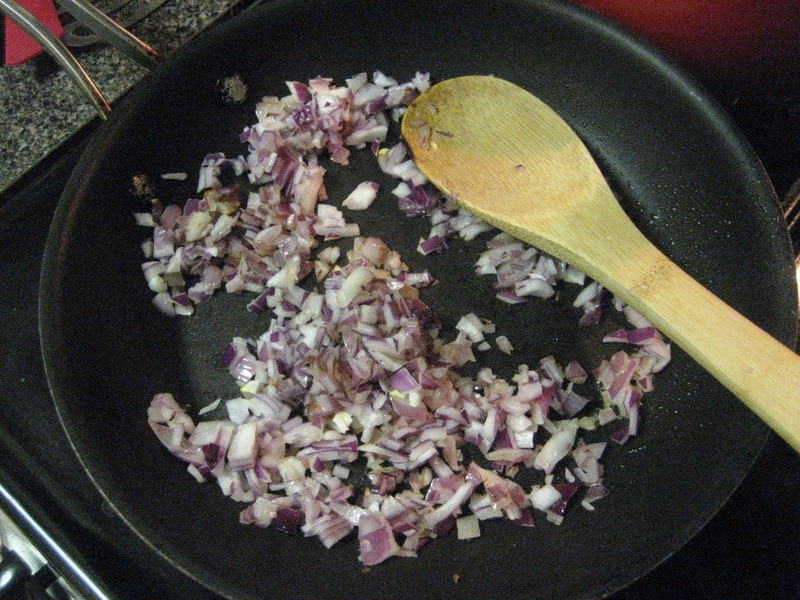 Take 1 small chopped red onion (or 1/2 large) and cook it in a pan with nonstick spray until the onion gets soft and caramelized – about 5 minutes. Remove from heat and let it sit for a few minutes to cool down. 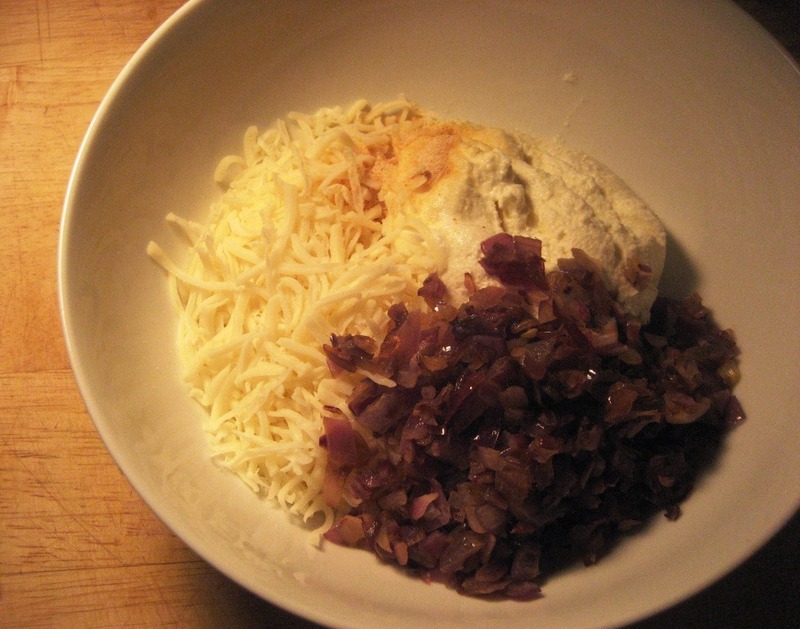 Meanwhile, add your shredded mozzarella, ricotta, and garlic power to a bowl, and then the onions once they’ve cooled a bit. Stir to combine, and your filling is complete. Easy peasy. Now, preheat your oven to 400 degrees. 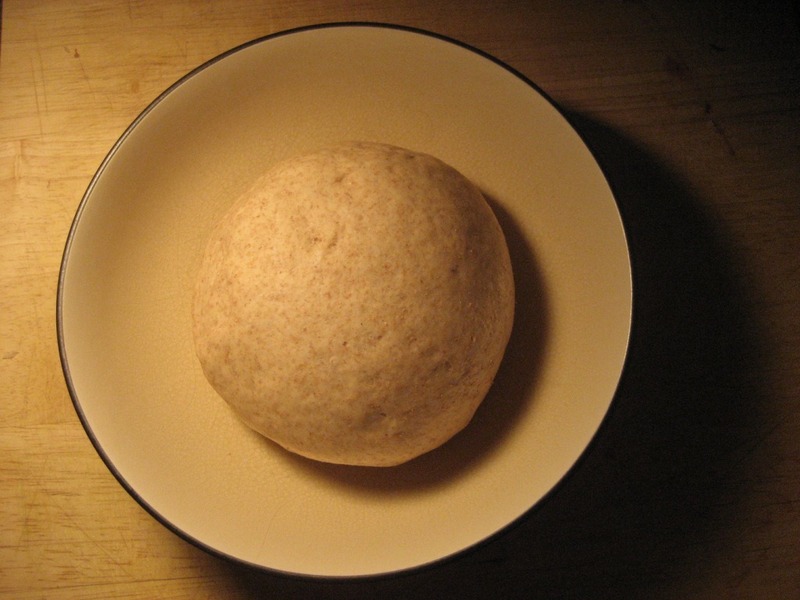 Your dough should have risen by now, and will look larger in the bowl and be a little puffy to the touch. Divide it into 4 equal pieces, and then roll them out into circles with a rolling pin on the same counter you kneaded the dough on. Clearly, they do not have to be perfectly round. 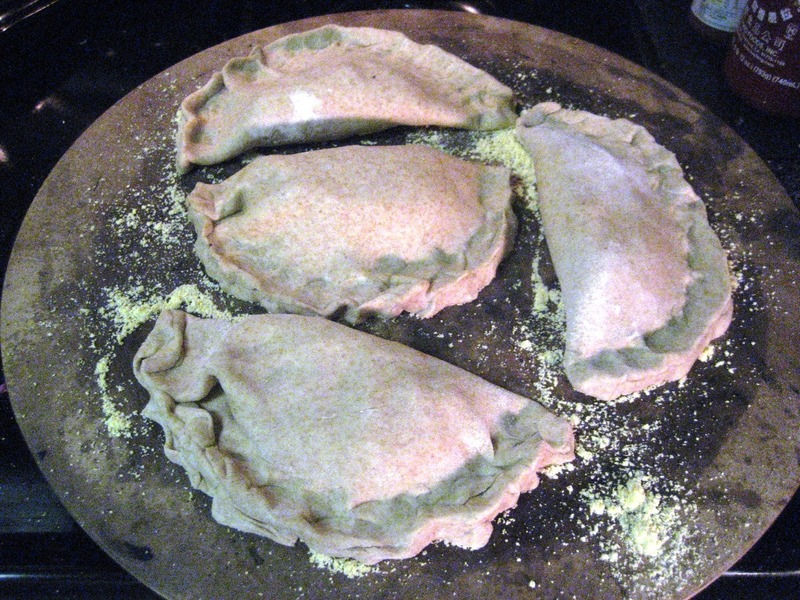 Now comes the fun part – assembling the calzones. 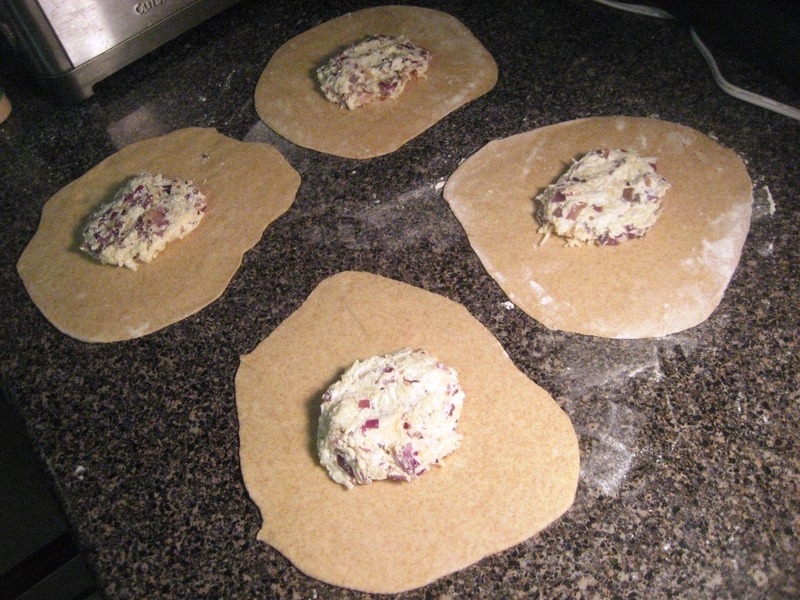 Add 1/4 of the filling to the middle of each of the circles of dough. 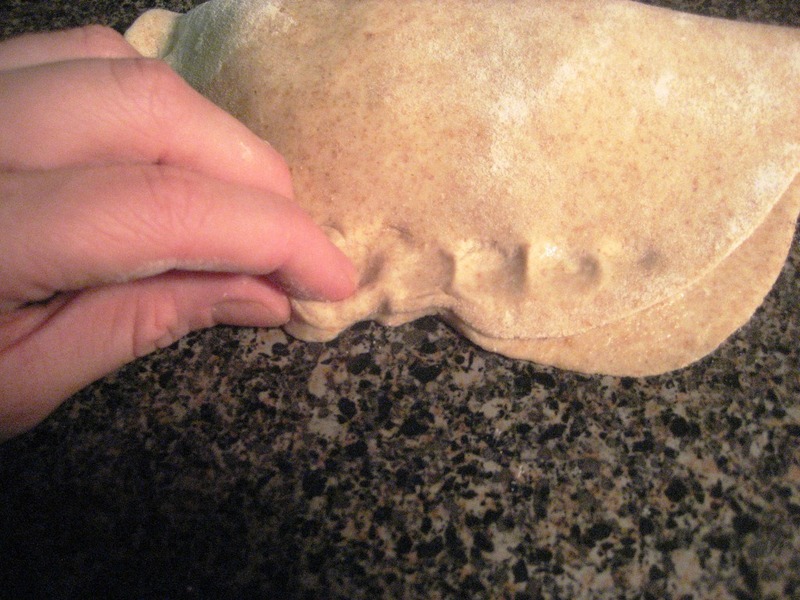 Dip your finger in water and wet half of the perimeter around the calzone, and then pull the dry side down over the filling. The sides probably won’t line up perfectly – don’t worry. 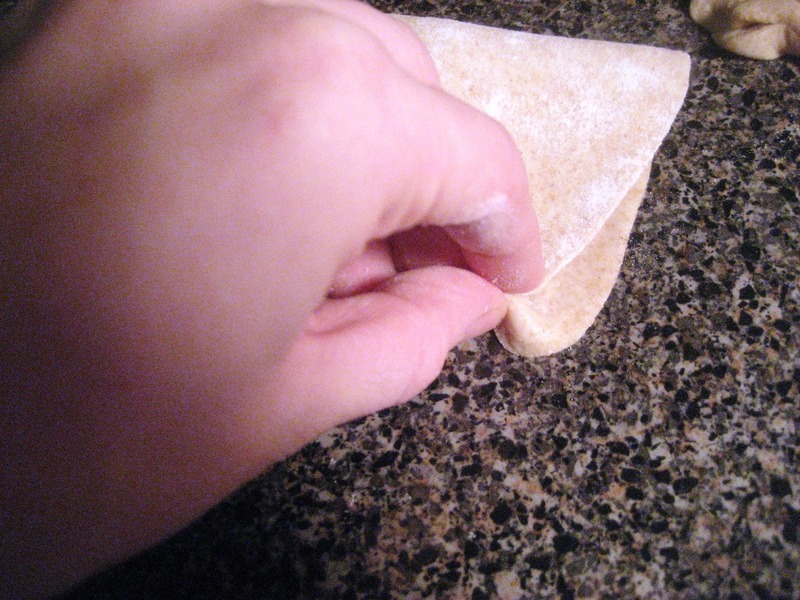 Using your fingers, pinch together the edges of the dough to form a seal – similar to how you would with a pie crust. (You can also use a fork for this but it’s more fun with your hands). They will look pretty rustic – but that’s encouraged. Repeat for all four calzones. Your oven should be preheated by now, and if you are using a pizza stone make sure you leave it in the oven while it preheats, and then use a little cornmeal on the surface to keep them from sticking. 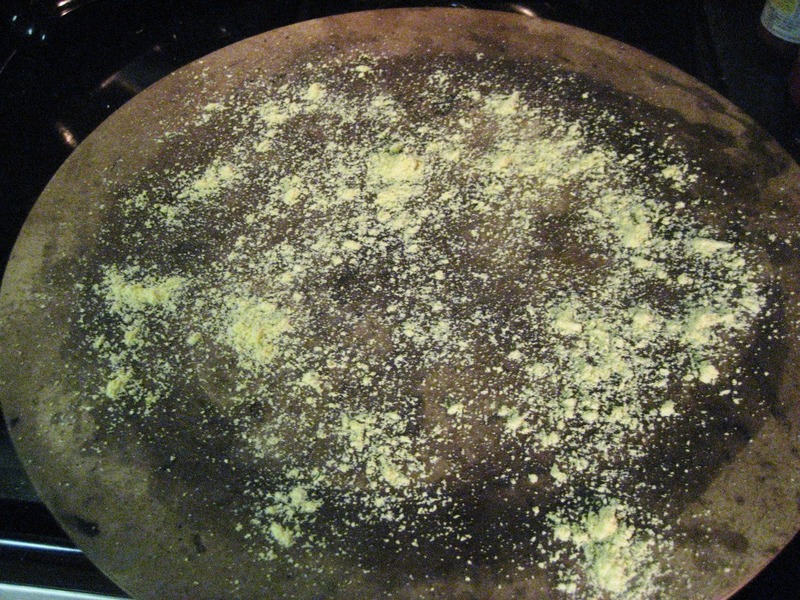 If you’re using a baking sheet, grease it with spray or oil and a little corn meal. Now transfer the assembled calzone onto your baking vehicle of choice. Put them in the oven for ~15 minutes, until the tops are browned, and then take them out. Now comes the really challenging part – don’t touch for 10 minutes. Rough, I know. Once 10 minutes have passed and they have cooled, they are ready to be devoured. I served mine with some marinara sauce for dipping. And could.not.wait. to cut it open and see the cheese ooze out. At this point, you can let them cool and freeze them if you want to save some for a rainy day. I froze half of mine and had one for dinner last night and one for lunch today, both with a salad on the side. While these are definitely a bit more labor intensive than my normal recipes, it only took 1 hour from start to finish and was actually quite fun – besides the kneading part. That was actually kind of hard, and I may have even broken a slight sweat. But, it was worth it for these babies. I cannot wait for lunch. 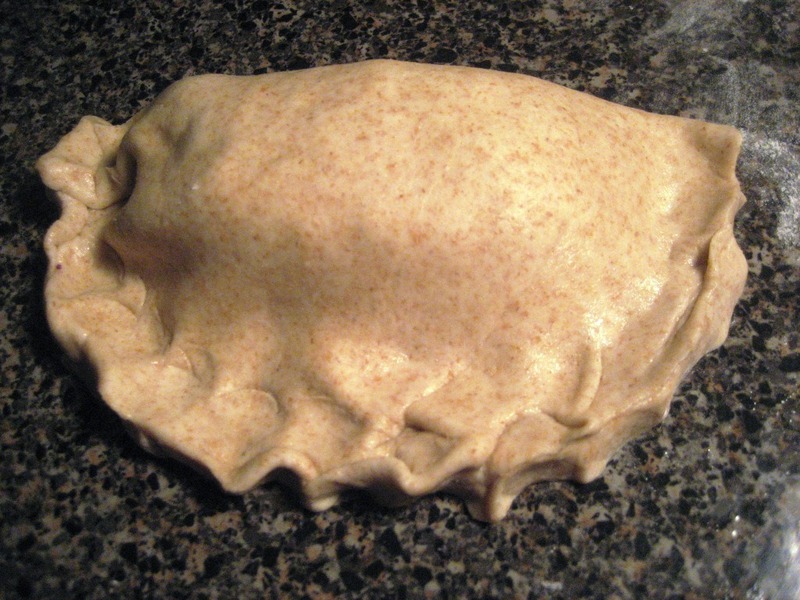 What is your favorite calzone stuffing/pizza topping combination if you could pick anything? I loooooove fried eggplant on pizza, and really love calzones with just mozzarella, riccotta, and roasted garlic. Beth, these look great. Can’t wait to try. And THANK YOU for making the recipes printable. I was getting a little crazy copying and pasting them into a word document to print! Oh good! I’m glad thats helpful for you. It’s gonna take me a while to convert them all but I’ll do that for all recipes going forward and hopefully back track a bit, too. 🙂 Have a good day! Yum! This looks awesome! I actually made a stromboli last night (very similar to calzone). I love to put cheese, onions, peppers, and sun dried tomatoes as toppings! Ohh sun dried tomatoes. What an awesome idea! What a great idea! I’m going to make these this weekend. My favorite filling is mozzarella and turkey pepperoni or chunks of chicken and broccoli. These look amazing – I can’t wait to try them! Oh wow Beth – those look delicious! Can’t say I’d make the dough too, but I will definitely be trying that filling mixture! We usually stick with “traditional” toppings like tomato/green pepper/olives/pepperoni. Beth, thanks!! They look delicious! I might give it a try this weekend. I’m thinking Mexican Calzones. Put some black beans or refried beans, scallions and cheese. Yummy goodness! 1 – those look amazing and so low point! Did 1 fill you up? 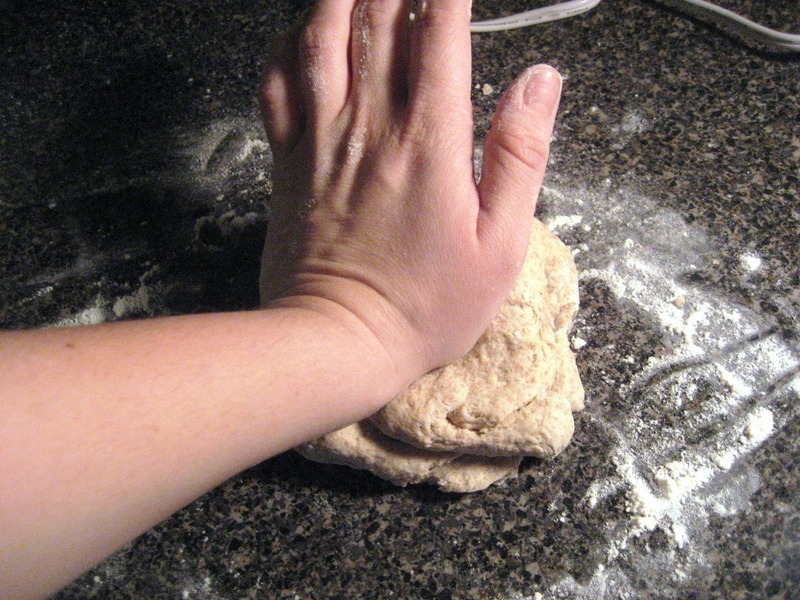 2 – I always look at the clock/count down while I’m kneading dough. 3 – I’ve been dying to make my recipes printable. I didn’t know that google had site creation. Would you be offended if I copied this strategy? 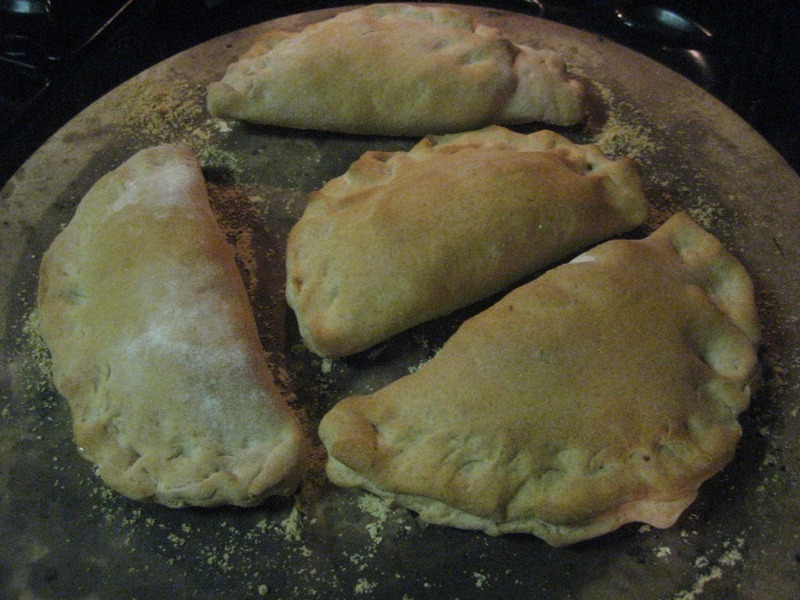 I made mini calzones last night too (I used the Weight Watchers recipe and just made cheese)! They were so delicious, and I can’t wait to play with the filling. This looks delicious! I like that it’s only 7 points. Also, love the print feature! 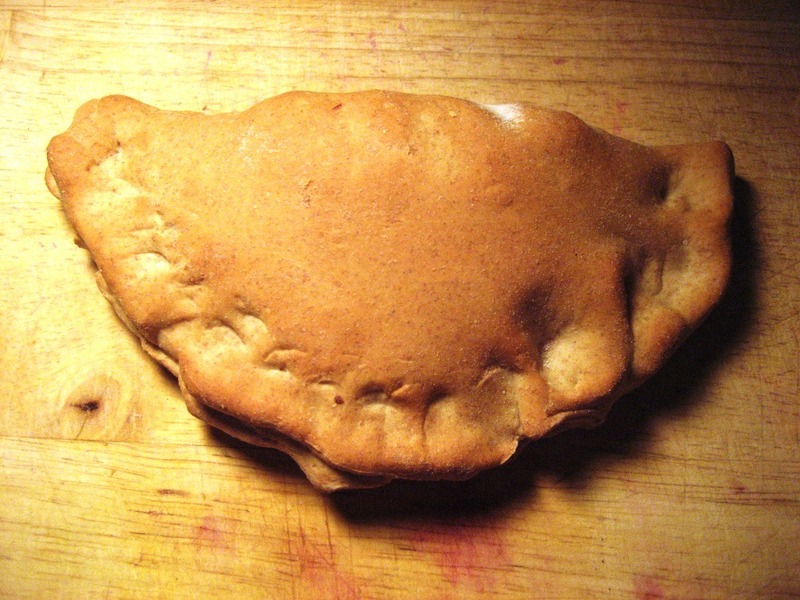 Oh calzones… Mon has been requesting the next time we do “pizza” night, that we do it as a “calzone” night. Which I’m down with… they’re always amazing! My favorite pizza/calzone topping MO is lots and lots of vegetables and then a meat of some sort, but I just love any combination really. What a great recipe! My favorite topping for pizza is roasted veggies, any combonation of veggies. 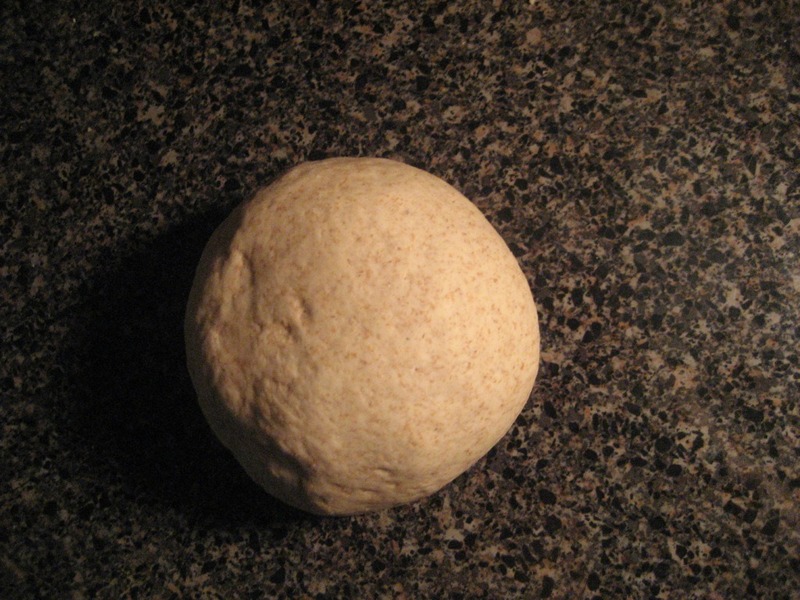 I love to use whole wheat pitas for crust. There are some really good ones out there with flax. I actually had one for breakfast this morning. OH and thanks for making your recipes printable. When I am online and I find recipies I want to try I print it out and 3-hole punch it right away and it goes into a binder that has all my healthy recipies filed in it, and I use that binder for all my menu planning, it really helps keep me organized and on track for healthy eating. That looks surprisingly easy! 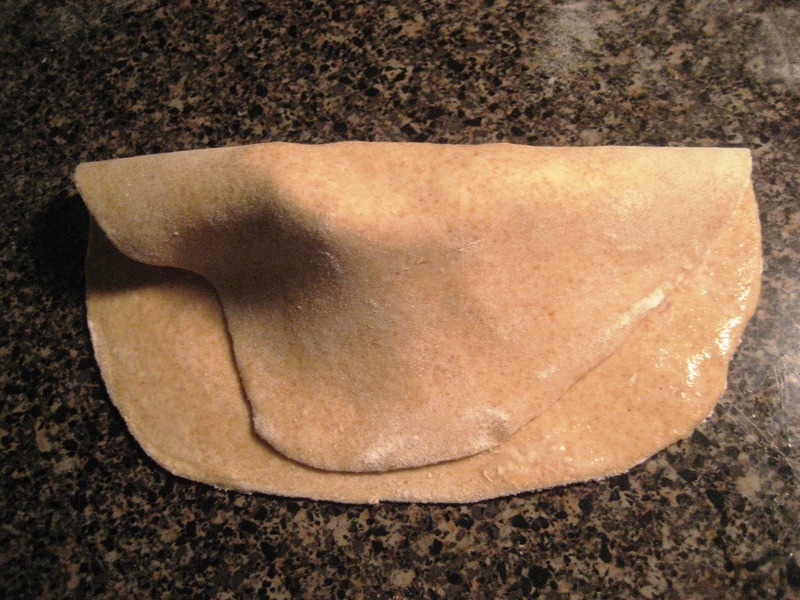 I love calzones, never made one myself though. wow, Beth, these look AMAZING !! I love red onion, this filling is perfect – I I love that it is simple and meat free! Those look super delicious! I’m so making them soon to break in my new pizza stone! So excited to use it! I love eggplant, spinach, and carmelized onions. Together or separate. Yum! Just made a quadruple batch of these for freezing (well, and dinner tonight). I did 8 of the exact recipe above, and then 8 with reduced fat cheddar cheese and a little diced ham and turkey. I was a little worried about the reduced fat cheese melting well, but it turned out fabulously! Thanks for the recipe! I made these for dinner tonight and they were SO delicious – I’m so glad I stumbled across your blog and I’m even happier that I doubled the recipe. Thank you for sharing this recipe and I cannot wait to try more of your creations. Hi Liz! So glad you found me and tried and loved these!